Crap, crap and more crap. I tripped over one of Dixie's toys again. You'd think I'd learn to watch where I am walking, especially knowing that she leaves her toys everywhere. And it's not like she has anywhere good to leave it as I have my crap everywhere...even if I were to train her to put her toys away. I bought some new storage containers that are stackable at an attempt to get more of my crap off the floor and up out of the way. It worked...kind of. I really need to buy out The Container Store. And probably move somewhere that has an actual kitchen. My "kitchen" is also my living room. My "countertop" is also my coffee table. My "pantry" is anywhere I can find an open spot for my food. No amount of stackable boxes would help with that issue. Shelves would be nice, assuming I had open wall space to attach them. I've been home sick from work this week and my mom stopped by to check on her "baby" and bring some supplies. She was instructed to make no comments about the mess. I am very, very embarrassed about my mess. I don't invite people over for this reason. I tell people that I'm a hoarder, but I honestly don't think many people actually believe me. And I never give anyone a chance to really find out as I refuse to let people see this mess. Well, there's a photo of my mess. Hi world, see my mess? My mother was good about not commenting. Except for one. She said she would like to bring a shovel and help me clean. See, to her, this is a mess and most of it can be tossed in the trash. But to me, I can justify everything on that pile. Every. Single. Thing. That empty box? I'm saving it for when I move so I can put my HK grill in it. The black bag? That's my dremel that has no shelf to live on. Those empty grocery bags? They are my trash bags, with nowhere to store them. That shelf on the top right edge of the photo is full of stuff. That pile of clothes sits on top of more completely full storage containers. My couch has sadly become a storage area. Purses, jackets, stuff for work, my quesadilla maker, and lots and lots of stuff from school--artwork, text books, framed photographs, a box of photographs. Pillows, my robe, all of my cameras, piles and piles of mail, pads of paper, markers...all without a true home. Behind the couch is my dog crates, kane-dog's has stuff stacked on top. The only reason Dixie's is clean is because she chews anything I put on top. Except for the vacuum attachment, which I've recently started storing up there. The treadmill behind her crate, yeah, it's got stuff on it too. My two sets of shelves are full. My two closets are full. And it's not like I have a bunch of useless junk either. One closet is full of clothes that I wear. All of it. The other closet is storage. Winter coats, pet supplies, my ski boots and rollerblades, stuff like that. Ok Mom, bring the shovel. I challenge you to not only help this hoarder organize, but also to find places for everything without a home. I'm creative and I'm really good at puzzles, but this is one puzzle I can't seem to figure out. About a year and a half ago, I celebrated my 34th birthday. My sister was gracious enough to host a small gathering at her house. While there, I opened some birthday cards from friends and family, some from the party attendees and others that I had recieved in the mail and brought along with me. I have a habit of not only keeping the cards, but keeping the envelopes the cards came in. My friends and family put thought into those envelopes (at least in my mind) when addressing the cards to me. Some used my nickname, some had to write out my address and their return address, and some decorated the envelopes with doodles and/or stickers. My sister is very aware of my "problem" with keeping stuff. As well intentioned as she thought she was being, she wouldn't let me keep my envelopes. And here it is, a year and a half later and I'm still thinking about those damn envelopes that I didn't get to keep. And speaking of lost "stuff" that haunts me, back when Dave and I lived in our first place, we were doing some tidying in preperation for our move to our house, and he threw away my license plates. They weren't just any license plates. They were from my first car. And they were imprinted, not like the plates of today where the letters and numbers are just painted on. I shouldn't care about these stupid plates, but yet I still think about them every so often. Wishing I still had them. This is why I have a really diffictul time throwing anything away. Will I regret it later? Will I still be thinking about it 5, 10, 30 years from now? Better safe than sorry, keep it. Let it add to the piles I've created. If my piles get too big, I can always take a load to the storage unit. That's what the unit is for, right? To keep "stuff". People don't understand how difficult it is to toss stuff away, unless they are hoarders themselves. That's why when Kate, or Dave, or even my mom threw some of my "trash" away, they thought they were helping, but in reality, they were making things worse. The only person that can toss my stuff is me. I have to make that decision. Me. Not you. While I appreciate the offer and I know everyone is well meaning, it's not helping me. I end up collecting more things to fill up the hole that was left from my missing stuff. So I started reading a book last night. Stuff, by Gail Steketee. Gail is a professor of human development or something (I could probably look it up to get my facts correct, but that part is irrelevant for now) and she did some case studies on hoarders. This book is the result. I read the first chapter and was able to relate to a lot of what "Irene" (Gail changed all the names for privacy) had to say about her stuff and why she keeps what she keeps. I'm looking forward to reading the rest of the chapters, but a little frightened that I'll see myself in others studied in the book as well. As I sit here typing this, I'm looking at my couch that is currently covered with my "stuff"....and I can justify every. single. thing. on it. At least I'm aware I have a problem, right? Everyone that knows me by either growing up with me, or watching me grow up, knows about "lizzy and her messy room". It's been a running family joke. I'm thinking an intervention could have helped around the time a mouse discovered the hidden bologna stash under my bed in the mid 1980s. Mom had thrown it away, I found it in the trash and not wanting to be wasteful, I took it and hid it...where it was promptly forgotten about. Until said mouse found it again for me. The mouse walking under a piece of paper woke me from a dead sleep and I woke up the entire family with my blood curdling scream. It's too bad that hoarding wasn't a known issue back in the 80s or 90s...maybe we could have gotten to the root of the issue and put a stop to it much earlier. I think I realized that it was much more than just a messy room a few years ago. I was researching OCD to see what other "symptoms" I had besides just the eating finger foods in twos (my coworkers loved that one), not liking people touching my stuff and a few other oddities. This OCD website mentioned that hoarding is another symptom of OCD. I always thought that OCD meant extremely clean and organized, never realized that "collecting" could be considered obsessive. And boy, do I have a ton of collections. I can pick up anything in my room or storage unit, and justify why it needs to be kept. "It was my first (fill in the blank)", "It could be worth money some day", "I didn't want to throw it away because I hadn't used at all yet", "It was the picture that (name any preschooler I've ever looked after or taught) made me"....I watched an episode of Hoarders a year or two ago and it really hit me...I actually could feel exactly what they were going through and why they were shedding those tears as they were being forced to rid themselves of their "junk". 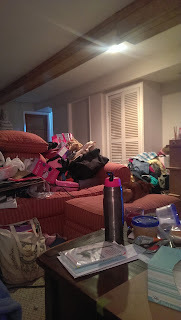 I've decided to put my thoughts on hoarding into a blog so that maybe I can better understand, as well as everyone else. I sometimes have a really difficult time putting my thoughts into words when first asked, and I honestly get tired of people asking me "why don't you just toss/donate/sell your crap?" If it were that easy, I would have a nice and tidy living space right now. Started this as an attempt to make sense of my "collections". I don't post regularly, just when the moment hits me....or when I get really frustrated by my mess....which is honestly more often than I post.